The family and friends who know me understand I am a long-standing, die-hard Razorback fan. My love for the Hogs began in 1945 when Bubba received a 4 year scholarship to play football at the University of Arkansas. I wasn’t able to attend any Razorback games while he was on the team, but when I became an undergraduate in 1957, I didn’t miss any home games in Fayetteville. During my 4 years in medical school in Little Rock, I don’t think I missed attending any games played in War Memorial Stadium there. I wasn’t able to attend many games either in Fayetteville or Little Rock during the 30 years Cathy and I lived and raised our children in El Dorado. It wasn’t that I stopped loving Razorback sports, but attending those games was far down on our priority list. In 1977 during Lou Holtz’s first year as head football coach, the Razorbacks had one of their best years, finishing the season 10-1 with the only loss to the Texas Longhorns by a score of 13-9. The Razorbacks were invited to play the Oklahoma Sooners in the Orange Bowl in Miami on January 1, 1978. As soon as the pairing was announced, Cathy and I began making plans to take our family in late December to visit her family in Fort Lauderdale, in hopes we could get tickets to attend the Orange Bowl. I called Cathy’s brother, George to see how many tickets he could get for us, because of his many connections. George was the Dean of Students at Broward Community College in Fort Lauderdale, and I knew if anyone could get good tickets, George would be the one! George came through and got great tickets for us. 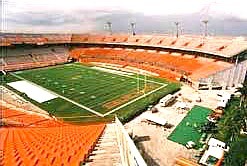 The game was played on January 2, 1978 in the Orange Bowl Stadium in Miami. The Orange Bowl was one of the premier bowl games every year, and this was the first time the Razorbacks had ever been invited to play. No one in the sports world apart from ardent Arkansas fans gave the Hogs even the slightest chance against the mighty Sooners from Oklahoma. They were ranked # 2 in the nation in all the polls with the undefeated Texas Longhorns ranked # 1. George, John and I were excited (especially me) as we drove the 30 + miles from Cathy’s parent’s home in Fort Lauderdale to the stadium in Miami. The game was played at night so the closer we got to our destination, we could see the bright lights of the stadium in the clear, crisp evening. We also saw many cars of OU fans with their signs and streamers proclaiming their Sooners as national champions. Notre Dame had defeated the Texas Longhorns in the Cotton Bowl earlier in the day, so all Oklahoma had to do was defeat the lowly Razorbacks and claim their national prize. As we walked into the stadium with our red shirts and hats, several O.U. fans told us we had wasted our time driving such a distance to witness an ugly slaughter! At the gate each of us was handed a tiny flashlight in the form of a candle and were told to leave the light off until the half-time show at which time we would be instructed what to do. Disney Productions was in charge of the half-time show, and it had been promoted as a typical Disney extravaganza. I noticed one fan after another turning their candle on with many of the children leaving theirs on as they took their seats. Although our seats were good with an excellent view of the field, we were seated high in the lower deck. There were many more OU fans present than Arkansas fans, and seated directly in front of us was a family of a husband, his wife and 2 children with O.U. shirts, hats and pom poms. They were very animated and vocal prior to kick-off, so we remained pretty subdued. George had given John his battery-powered fog horn that he normally used on his boat. He told John to use it sparingly because it was very loud. (Wrong thing to tell a 10-year-old!) The Razorbacks jumped to an early lead in the game and as our nearby O.U. fans became more subdued, our cheering with fog horn emphasis increased. The folks in front of us particularly cringed when John blew the horn, which he did every time our team made a first down. Something happened at half-time that I have never forgotten. When the Disney people took charge of the program, we were all reminded to turn off our candles if we hadn’t already done so. We were told when it was the appropriate time, we would be instructed th to turn on the light. The announcer of the program then said, “Let’s begin the show,” and all the stadium lights were turned off. I was struck by the extreme darkness that enveloped the stadium. As I looked around, I noted I would have had difficulty leaving my seat and walking down the long flight of stairs if we had an emergency requiring an immediate exit. It was impossible to see much beyond a few rows ahead in such darkness. Then something happened that impressed me greatly. Across the stadium in about row 25, one person turned on their light, long before the announcer instructed us to do so. It was a young man whom I estimated to be a teenager. I could almost see his face clearly even though moments before I could not see anything farther away than 8-10 feet. PS: For those who don’t remember, the Razorbacks trounced the Sooners 31-6 that night at the Orange Bowl. After the game we couldn’t find any of those Oklahoma fans who questioned our intelligence for even attending. Love it! And I’m still loving ALL your blogs!! I look forward to reading them! Thank you! Again, thank you for sharing some of the stories of Dad that I don’t remember hearing before. Much love and Merry Christmas to you and your family. Thanks Rachel. Just like your Dad, you are a wonderful encourager to me. May all the Uth’s have the best Christmas ever! We are looking forward to being with you in 2015 if the “Moore Reunion” takes place in Branson.